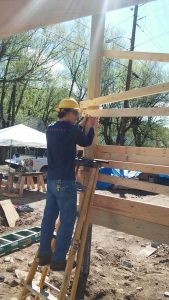 On Saturday, May 30, 2015, a handful of Alpiners volunteered with Flatirons Habitat for Humanity in Jamestown, CO. The project was to help rebuild a home from the ground up in the little mountain town that had been destroyed in The Great Boulder Flood of 2013. Our own Donnie Dorrow from our Denver location was clearly the master carpenter. The rest of the crew, though less experienced, displayed a lot of heart and willingness to learn. When it was all said and done, we all had a great time.